Wintertime can be especially perilous for our feathered friends. Learn what you can do to help birds survive. Have you ever wondered why wild birds need people to feed them? After all, they existed here long before people settled our region. In Illinois, about 60 percent of the land, some 22 million acres, was once tall-grass prairie. Today, only about 2,500 acres of prairie remain, according to the Illinois Department of Resources. Most former prairies are now farmland, and provide almost no nutrition to birds, especially in wintertime, when they need it most. And their calorie needs are highest at a time when food sources are scarcest. Sunlight hours are shorter, insects aren’t flying around and few fruits are available on bushes and trees. But there’s an even bigger threat to birds than starvation. More wild birds perish from dehydration than hunger. Flying long distances to find open water sources is also taxing for birds. A heated birdbath warms water just enough to keep it liquid and will likely attract even more birds to your yard than a feeder does, Rezin says. Bird watchers notice that, on a very cold day, birds look extra fluffy. Birds have other defenses against the cold, too. Some huddle together to conserve warmth. Some slow down their metabolic rate to a state of “torpor,” which requires less calories. Birds are resourceful at finding shelter in tree cavities, nesting boxes and other structures. Even so, winter is a dangerous time for birds and many don’t survive it. Sometimes thousands of them perish during a deep freeze or after a storm that causes deep snow and ice cover, which cuts them off from their natural food supply. So how can we help them? By consistently feeding them high-calorie foods and providing liquid water. See box at right for suggestions from the National Wildlife Foundation. Planting bird-friendly shrubs and trees is always a good idea. Certain types of bayberry, sumac, dogwood, viburnum and winterberry provide food through the winter, as well as shelter. In the birdfeeder, the type of bird food you provide really does make a difference and fresh seed is more nutritious than stale seed. Avoid bird food containing wheat or grain products, flax or canary seed, he says. Look for mixes with a high content of black oil or striped sunflower seeds, safflower seeds and pieces of peanut or other natural nuts. To attract finches, put out nyger thistle seeds. Suet is a good way to provide fat calories and is sure to attract woodpeckers. If you enjoy feeding birds, but don’t like the mess of dropped seed hulls below your feeder, consider purchasing “no mess” mixes that are purely food, with no seed hulls or shells. These are so popular at Wild Birds Unlimited that the company has expanded its offerings from one to three varieties. It comes as no surprise that the No. 1 problem bird lovers complain about is squirrels and other critters raiding the birdfeeder. “If you go to a big-box store and look at the rows and rows of ‘squirrel-proof’ birdfeeders, you can be sure that at least 90 percent of them are not going to stop squirrels,” says Rezin, who stocks six or seven feeders in his store, most with lifetime warrantees. Just as important as the feeders are the pole systems that support them, since a feeder placed on a freestanding pole is far more likely to foil critters. Rezin’s poles have a screw-in base that goes about 1.5 feet into the ground to stabilize them for as many straight or curved extensions as the owner would like to add. The extensions can hold birdfeeders of various kinds at various heights. The basic setup, with two hangers, starts at $70. Rezin also sells a wide, smooth steel baffle that prevents any crafty animal from shimmying up the pole to the feeder. “If you can’t squirrel-proof a feeder, you can squirrel-proof a pole,” says Rezin. Caring for our feathered friends takes little effort and brings us many hours of pleasure, especially on a cold, winter day, when only the birds are bringing life to our frozen landscape. It’s for the birds – but it’s for us, too. The National Wildlife Foundation suggests that bird lovers do the following. 1. Put out feeders with good size capacity. 2. Provide nutritious winter seed foods. 3. Offer fatty foods, too, like suet or peanut butter. Fat has more calories per gram than carbohydrates or protein. 4. Be consistent and keep feeding through the winter. If you leave home for an extended period, try to have a neighbor keep the feeders going. 5. Remember water. Birds need liquid water. 6. Stamp down the snow below a feeder. 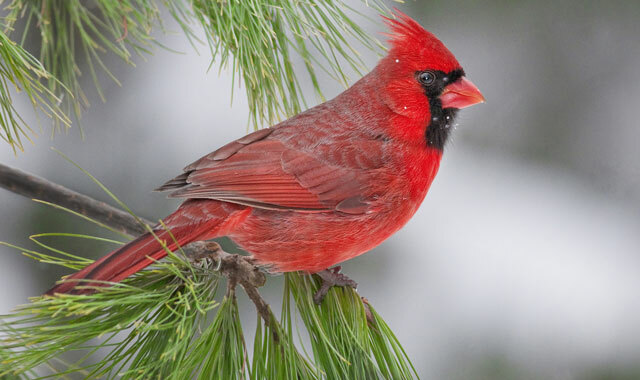 Ground-feeding birds will gather seed that drops if they don’t have deep snow to try to manage. 7. Hang feeders in locations that don’t have hiding places for sneak-attacks by cats and other predators – 10 to 12 feet from shrubs or brush piles. This gives the birds some time to react. 8. Clean feeders each season and thoroughly dry them before using again. 9. Stock up on seed. Stored properly, in cool, dry places, it can last for months. This entry was posted on Wednesday, November 16th, 2016 at 11:53 am	and is filed under Mind & Spirit. You can follow any responses to this entry through the RSS 2.0 feed. Both comments and pings are currently closed.